When? 2017 | What’s it rated? NR | Where’s it available? Streaming on Amazon. Is it technically considered a binge if you gleefully gobble up the only cookie in the package? It is if you sit there dazed, confused, and delighted, wondering how and when you’ll get your next fix. Enter Amazon’s pilot program: Every year, a handful of show runners create pilot episodes of new shows for the site’s streaming service. Based on feedback from Amazon Prime users, the bingeable shows can become series, at least in theory. After bringing her beloved Gilmore Girls series back to Netflix in November, the wacky, whimsical show creator Amy Sherman Palladino (along with husband Dan Palladino) is serving up the original period pilot The Marvelous Mrs. Maisel on Amazon. If you didn’t know that Sherman Palladino was behind this show, you wouldn’t have guessed it, and that’s amazing, because this show is a whole new level above even the Luke and Lorelai glory days of Gilmore Girls. Set in 1958, we first meet our protagonist, Midge Maisel (House of Cards’ Rachel Brosnahan), through a flashback where she’s giving a speech at her wedding that has guests practically rolling on the floor laughing. Her dad, Abe Weinberg (Monk’s Tony Shalhoub), acts as her unwitting comedic wingman. It’s a small wink at what’s in store for Midge. Fast-forward about four years later, and Midge and her husband Joel (Michael Zegen of Boardwalk Empire) seem to have the perfect New York City life. They live on the upper West Side, have two kids, and the rabbi is finally coming to their Yom Kippur meal. 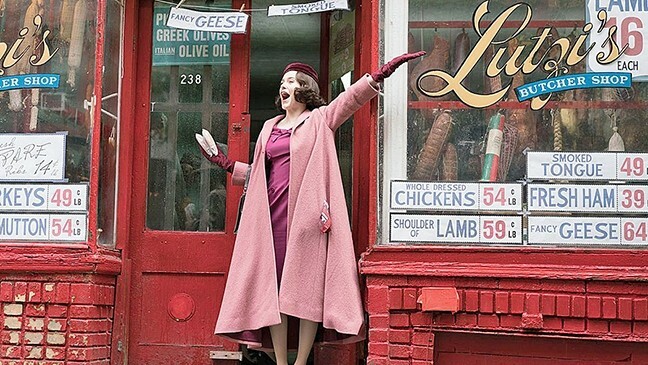 Because the show isn’t set in modern day, it forces Sherman Palladino to step away from her comedy go-to of characters constantly spitting out pop culture references. There’s still witty banter and a few era-appropriate references, but as a result, the characters feel much more real and grounded. Plus, the ’50s wardrobe and makeup choices are on point. While Joel has a big-time job doing something boring, he secretly yearns to be a stand-up comedian. Being the dutiful wife that she is, Midge supports him in this hobby, even cooking brisket for the manager at the club so Joel can get a better time slot for his set. She writes down notes for him based on the audience’s reactions and even offers up a joke or two for him to use. Still, there are cracks in this seemingly perfect life. After four years of marriage, Midge still wakes up at the crack of dawn to put on her makeup and do her hair, crawling back into bed before her husband wakes up. Midge treats her kids like nice props in her shiny life and is obsessed with measuring her baby girl’s forehead, for fear it’s getting too big. And Midge is let down and confused when she finds out her husband has been ripping off material from a famous comedian.